We build affordable, high performance, ultra-efficient, healthy (fresh air) homes. The model homes below are UNITY Homes, built in New England. They represent the highest standards in green, healthy home building today, and Landicity is a builder of UNITY HOMES in the Maine Mid-Coast area. an affordable house. 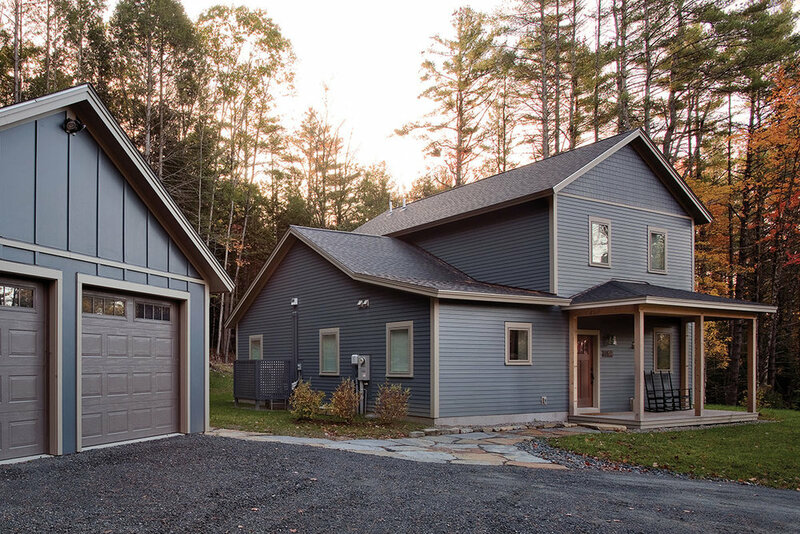 Compared to a conventional stick-built new home, IRC 2015 standards, a "Yankee Green High Performance Home" is now trending at 2%-5% more but with monthly dollar savings. Overall it is less expensive. "Yankee Green High Performance" maximizes the land, siting, resources and money to create a sustainable home environment which is healthy, comfortable, air tight and durable and energy efficient. It is simply common sense, net energy or not, solar or not! Just because a home is built "new" does not mean it really is new. Most builders in the Mid-Coast area may tell you they build to the latest, most current building codes. They do because Maine only requires the older IRC 2009 as current. Many builders are likely using 6-9 year old standards and are behind the technology. Much has changed since 2009. Maine is just now transitioning to 2015 IRC in the coming year (2018). However, Maine exempts the new code for testing, keeping the 2009 IRC 7 ACH50 “big hole” specification.. 2009 IRC is 7 ACH50, a very big hole in the wall,. The 2015 IRC is smaller but still a significant hole with 3 ACH50. Our recent NEW house tested at 0.7 ACH50. One IRC standard hole is ~ 3ftsq; one is 1sqft, while one is the size of a dryer vent hole. That is Passive Haus standards at 0.6 ACH50. The highest building standard. One cannot take a traditional stick-built design and "super insulate it" and expect excellent results. The home must be properly designed from the beginning to be high performance along with the correctly matched energy and fresh air healthy systems. Landicity Builders builds to the most current IRC 2015+ standards with continual upgrades and improvements. While many other builders may not blower test, we do blower test with outstanding results. New 2018 IRC standards are being adopted by many states and we incorporate them whenever feasible. Landicity® Builders currently has lots available in the new Douglas Ridge Estates development. We will build your green, ultra-efficient, healthy home on a beautiful lot. Visit the Real Estate page for more details. Be in your home by Summer 2018! We are proud to work with the world's best green home builders and manufacturers, UNITY Homes. Utilizing building practices from across the world, Unity homes are built to last for hundreds of years with the highest green standards. Landicity® Builders builds high performance, highly engineered Unity Homes in Mid-Coast Maine and the surrounding locations.. Our team includes experienced builders and engineers, all committed to healthy, green homes; ready to help you build the ultra-efficient home of your dreams. The Värm is an extremely flexible design platform that can be configured to look like a classic colonial, country farmhouse, basic barn, or even a clean modernist home. The Värm takes full advantage of our integrated building components. 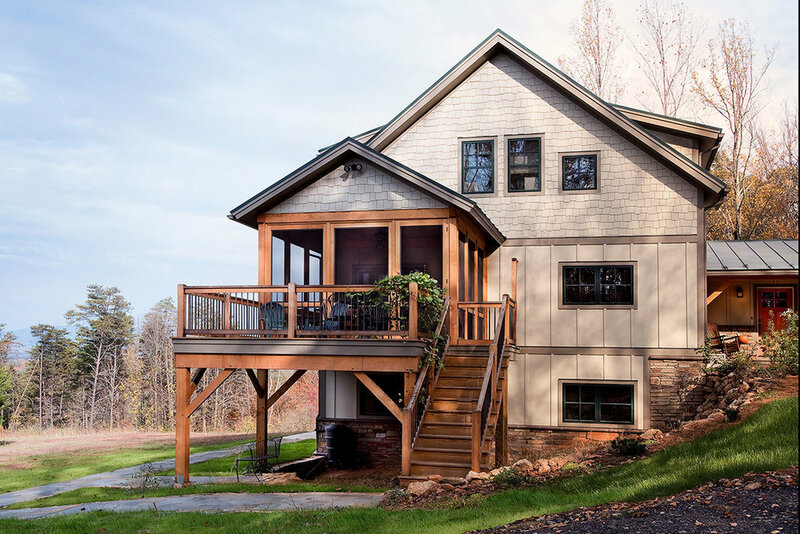 The platform easily accommodates—or you can add-on later—connected porches, garages, sunscreen overhangs, or even a hip roof. It’s an excellent choice for owners who need a home office, or for larger families in which being able to have separate living areas can be essential. The design also works well at various lengths, and the full-height second story maximizes living space, which is particularly helpful when your building site is limited. At the same time, Värms offer plenty of roof area so you can easily achieve Net-Zero energy requirements with photovoltaics. The Tradd platform is essentially a classic New England “Cape” raised to a full two stories, with the second level organized under the roofline. A basic Tradd is about 2000 square feet, has two to four bedrooms, and usually features two or three full baths and a half-bath. But we can easily integrate additional bedrooms, baths, and floor space. Other options include covered or screen porches, different types of dormers, various entry styles, attached garages, and one-level connectors. This interior can be designed with vaulted spaces and private nooks, all while meeting our stringent goals for efficiency. It’s also the platform that can feature exposed timber framing throughout. 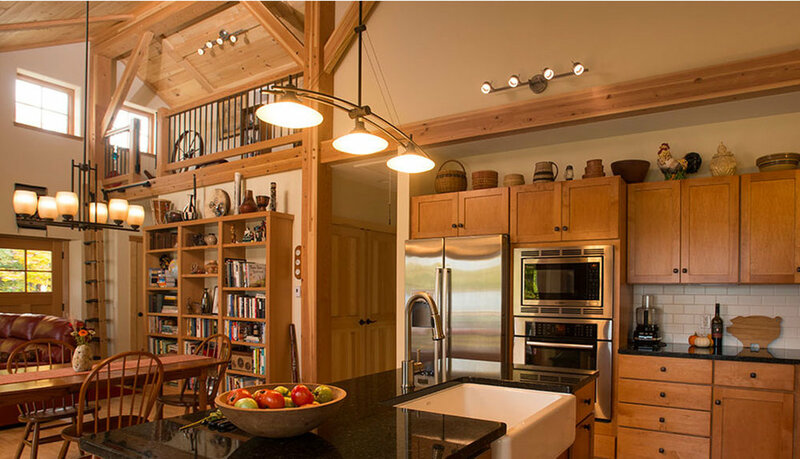 So you can have the timelessness of timber-frame design while meeting the latest energy-efficiency standards. The Xyla is designed so you can “live large” in a small, extremely energy-efficient one-story space. Connectors, laundry rooms, garages, art studios, and other separate rooms can be added to expand this platform to fit your needs. The lowest-cost platform, Xyla homes typically range from 1,100 to 1,600 square feet, and have 2-3 bedrooms and 1-2 baths. Built low to the ground, they combine natural light with deep overhangs for additional shade in the summer. When the first Xyla was built across the river in Vermont, it was tested by Efficiency Vermont and received a Home Energy Rating System (HERS) score of 44, and a 5-Star-Plus Certification for excellence in energy efficiency. That’s 86% more efficient than the average American home. In terms of air infiltration, it tested at .51 ACH50, which is almost 20% better than the stringent Passive House standard. A modern design, the Zūm’s open-plan living space can be configured in many ways to separate public and private spaces. The airtight construction virtually eliminates drafts and outside noise. 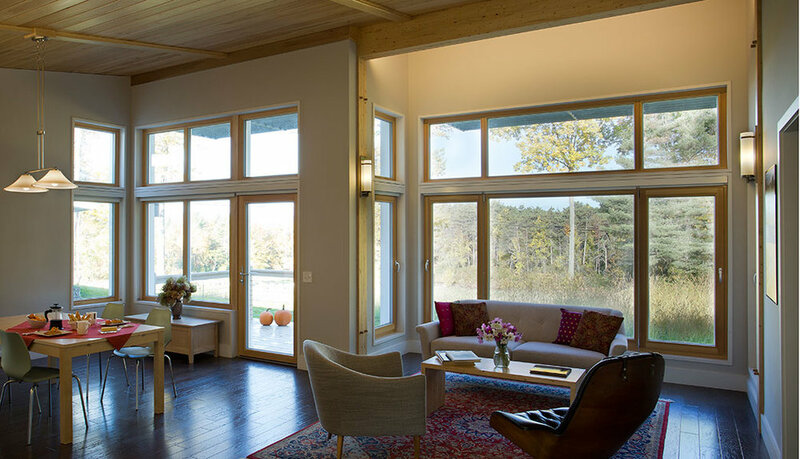 Plus, since it’s designed and oriented to maximize natural light and solar gain, the temperature remains even, something that’s typically hard to achieve in a one-story home. The Zūm evolved from a collaboration that began in 2006 between Bensonwood Homes, MIT’s Open Source Building Alliance, and other industry partners who came together to start the Open Prototype Initiative (OPI). 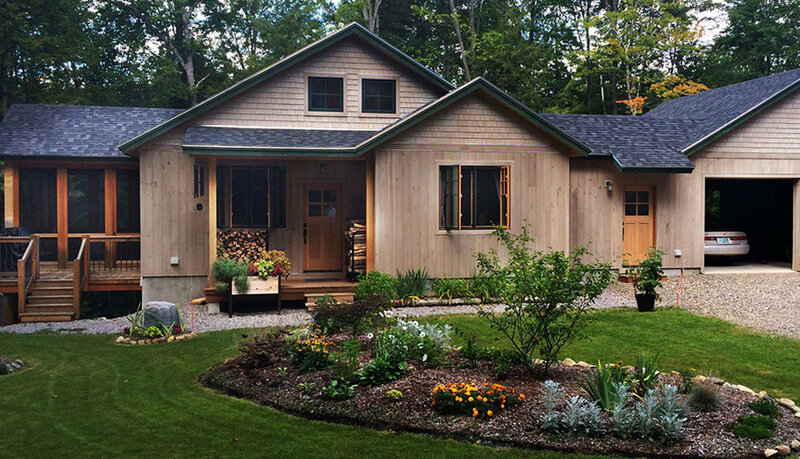 The prototype Zūm was an energy-efficient modern-style home we built in Maine for the President of Unity College. Since the college’s focus is environmental studies, the home had to achieve both Net-Zero and LEED Platinum ratings. 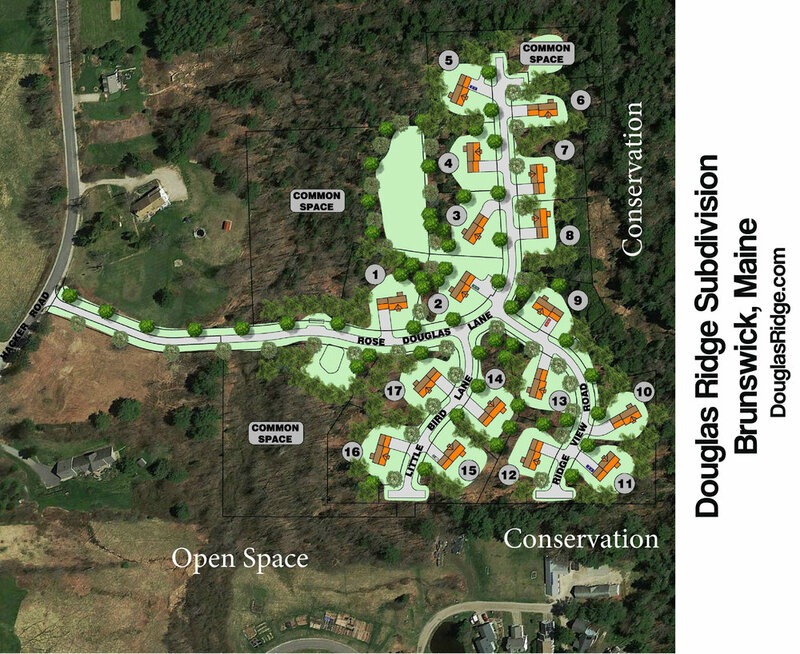 Douglas Ridge offers seventeen home lots and green home designs featuring a variety of styles, built with the highest quality standards and always with green, sustainable materials. Contact us. We are preferred builders, and offer general contractor services. Click HIRE US in the menu.